The Mayor of London has pledged £14K to Good Food Catford! Vicky Skingley, a nutritionist in Catford, is passionate about healthy eating and believes everybody should have access to affordable, good quality food. Along with many other residents in Catford she also wants to revitalise the local high street and create a new shopping hub, which will bring new life to the area. Her project, Good Food Catford, is a social enterprise that aims to achieve both of these things by opening a community grocery store in a boarded up shop unit. Working with local growers Vicky plans to set up an allotment veg exchange and sell locally produced food. She will also bring residents together by running food workshops and a quarterly supper club. Another big part of the project is to improve the appearance of Catford high street and restore civic pride in the area. Vicky will do this by planting fresh herbs that visitors can help themselves to and support local businesses to move into other vacant shops nearby. To date, over 150 people have backed Vicky’s crowdfunding campaign. 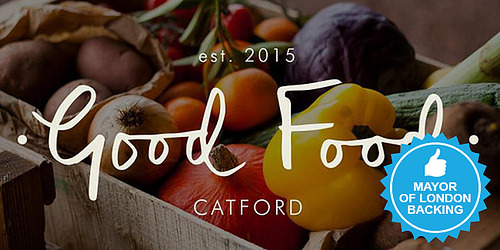 The Mayor of London has pledged £14,000 to help make Good Food Catford a reality.